Update: 18 March 2009-Abbass Ould Brahim was released after being held for three days, and the Taqadoumy website was allowed  to reopen 24 hours after the Nouakchott prosecutor’s office ordered its closure. Abbass Ould Braham, a Mauritanian online journalist was arrested  this past Monday, 16 March 2009, for an article he published on Taqadoumy  website. News of his arrest was reported by Taqadoumy.com  and echoed by number of Mauritanian websites . Freelance journalist and University of Nouakchott Professor Abbass Ould Braham was seized by police this evening. He was at a cafe in Nouakchott with friends, when two police officers entered the cafe and forced him to leave with them. The police did not produce an official warrant for his arrest. When his friend asked why they were taking Abbass away, the police answered that in was in relation to the articles he writes regularly for Taqadoumy.com, an online newspaper that publishes articles criticizing the current political figures who took power via a coup d'etat. Abbass remains in custody and there is not yet any further information regarding his release. 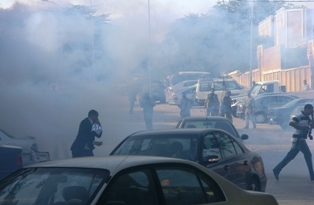 Dozens of Mauritanian journalists tried to stage a sit-in late Monday in front of the UN office in Nouakchott in solidarity with the journalist Abbass Ould Braham when the Mauritanian riot police raided the site, firing tear gas at them and allegedly beating them with truncheons . A Facebook group  has also been created in support of Abbass. This is not the first case of online journalist to be arrested, a journalist from Taqadoumy.com, Cheikh Ould Ahmed, has also been sued  in the past for defamation by Senator from Kankossa. Cheikh Ould Ahmed has ben released later under judicial control. Chinguitel  and Mauritel, the two main ISP's in Mauritania have been ordered by the General Persecutor , Seyid Ould Ghaïlani, to block access to what is considered to be the country's second biggest news website,Taqadoumy . Today, Mauritel , Mauritania's state-owned telecommunications company, followed the block order by banning the website . If confirmed, this is the first  case (since 2005 Mauritanian coup d'état ) of barring Mauritanian Internet users from accessing a Mauritanian website. The Sahara Media  news agency, considered the first news site in Mauritania, was also disabled for one to two days, while anbaa  was not only hacked, but its office in Nouakchott was vandalised and computers were stolen, said Maloum, who is the coordinator of the For Mauritania website, a lobby group. The attack against the Anbaa  website seems to be connected  to the website’s intent to publish content related to scandals involving politicians and senior public figures in the country.